Our 2019 Youth Program is up and running with our keenest paddlers out on regular river runs and training with this year's Slalom Program with Alberta Slalom Kayak. Specialized programs are also organized for youth through local coaches and Aquabatics. The following are some of the programs for this paddling year. Check out the calendar page for more details on the sessions described below! This course is designed for 7-10-year-olds as an Introduction to the world of paddling activities. Over three days we will visit some of the most spectacular lakes in the area and enjoy many good times on the water. We will use beginner friendly equipment and venues to create a safe and fun learning environment. This is a great option if you are looking to get your little ones into paddling early. Are you a Beginner paddler? Have you never tried yet always fancied it? Do you have a lust for adventure that can be suppressed no longer? The zero to hero program is a four-week program designed to get you from having never sat in a boat; to sending it down Whitewater rapids with style. Over four days/sessions you will learn all the necessary skills to enter the world of Whitewater paddle sports. This will include equipment, weather, water levels, basic paddling technique, decision making, navigating obstacles and rapids, and ultimately having the best times making great friends in some of the most picturesque landscapes on the planet. Paddling season has arrived once more! What better way to ease back into it than with the comfort of a professional coach to help you dust off the cobwebs and awake the Whitewater muscles from hibernation. This is the step up from zero to hero. So we have paddled Whitewater. We now want to look towards increasing our understanding of how rivers work and how we can navigate them more efficiently with less fatigue and nerves. Here we will go into much more depth in regard to how we move depending on the river feature, hazard identification, equipment choice and limitations, decision making, line choice, etc... This is a great course for inspiring confidence and experimenting in a safe environment. You should come away from this with a much better understanding of river features, hazards, making plans, when to know before you go, when not to go, and a generally more competent, confident, able member of a paddling group. For the grade 2 paddler. 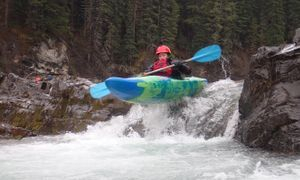 This is a bread and butter course if you are paddling and enjoying grade 2 white water (Kananaskis or red deer for example). The coaching will be specific to the Individual and the skills worked on will be dictated by you. What do you want to Improve? Do you want to move around the river with less effort? Do you want to learn to surf? Do you want to get better in your little/play boat? Do you want to start looking at boofing? Are we thinking about some tricks/freestyle on the river? Getting better at rescues? More rope work? Safer swimming? There is no limit to what we can work on in this course. As well as general improvement we will take a more in-depth look at Whitewater safety and rescue skills, strong decision making, and safe swimming. This course is for those looking to take steps into the world of playboats, surfing, and turning the river features into a playground. During the course you will learn how to identify the hazards involved in using river features and how to manage yourself and your group to keep everyone safe whilst playing. You will be introduced to more advanced boat control and a more detailed approach to how your boat, body, and blade can be used to create a slice of the magic we see the professionals do. The highest level of Whitewater coaching we do. Grade 3 and 4 water are on the table here and we are looking at keeping ourselves and our group safe whilst efficiently navigating up to class 4+ water. This is great for the boater that is paddling class 3 and wants to make the move to class 4, and anyone that is looking for more knowledge and confidence of navigating advanced water. How we set up safety will be covered and the factors that affect our decisions will be made clear. A Whitewater roll is necessary for participation in this course. The bow valley has produced some very very strong slalom kayakers and the next generation is looking good. We will be training in preparation for Alberta Summer Games and for Canadian national championships, as well as the wider goal of creating paddlers who have a great skills foundation to paddle for life! A completed waiver or Acknowledgement of Risk form is required from all course / camp participants.